While no one vendor can help you with all the requirements, RedSeal provides strong CIP support in the areas of network architecture, testing, device inventory and simulation. Get strong support for NERC CIP Standards compliance. The North American Electric Reliability Corporation (NERC) Critical Infrastructure Protection (CIP) Reliability Standards define a comprehensive set of requirements that are the basis for maintaining the reliability of the North American Bulk Electric System (BES) and protecting it from cyber-attacks. However, NERC Registered Entities struggle to define security best practices and controls that will easily meet the standards. NERC Sanction Guidelines include penalties of up to $1 million per day per violation, which is the highest financial penalty of any regulatory framework in North America. Also, the NERC CIP Standards continue to evolve, as do the interpretations as to what constitutes acceptable control activities under the standard. As NERC CIP Version 6 compliance has become mandatory, utilities need to invest in systems that allow them to meet the standard with the lowest operational overhead. 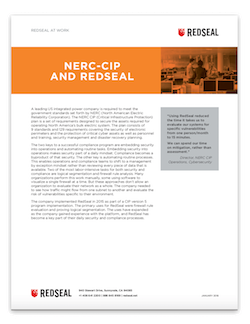 While all NERC CIP Version 6 requirements cannot be addressed by any single vendor, RedSeal provides strong CIP support in the areas of network architecture, testing, device inventory, simulation, and cybersecurity analytics. The RedSeal cybersecurity analytics platform’s unique ability to analyze large scale, multi-vendor networks and evaluate them against a target security architecture makes reaching that goal much easier. By replacing labor-intensive manual analysis with automation, organizations can become NERC CIP Version 6 compliant on a continuous basis, simultaneously improving security and lowering costs.